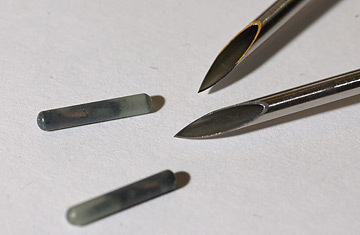 Tiny radio frequency identification (RFID) computer chips with the needles used to implant them under the skin. You may not know what RFID stands for, but you're probably using the technology on a daily basis. RFID (that is, radio frequency identification) is in passports, in electronic toll-collection tags, in credit cards, metrocards, library books and car keys. Like conventional bar codes, RFID chips store and relay information, and allow for the identification of commercial products  and, now, of house pets and people too. Human "tagging" was approved by the Food and Drug Administration in 2004 to facilitate retrieval of private medical records, but the procedure has had few takers. It's still purely voluntary and last week, California Gov. Schwarzenegger sought to keep it that way, signing a bill that makes it illegal for employers to force workers to have RFID devices implanted as a means for receiving paychecks or government benefits. But this summer, a large pilot program involving hundreds of human patients got under way at the Alzheimer's Community Care agency in West Palm Beach, Florida. The maker of the RFID chips used in the program, VeriChip Corporation, a subsidiary of the Delray Beachbased Applied Digital Solutions, is funding the initiative and wants to market its tags to the roughly 45 million high-risk patients in the U.S. with diseases such as Alzheimer's, diabetes, cancer and heart disease. The company says these patients can benefit from having instant and accurate access to medical records, which the chip would provide. "The medical community understands the need for a comprehensive electronic medical record that has portability," says VeriChip Chairman and CEO Scott Silverman. "What goes on in emergency rooms and even in practices today is archaic. Pen-and-paper record keeping is 97% of medical records today; 98,000 deaths occurred last year in emergency rooms because of no information or inaccurate information." To date 2,000 people worldwide have voluntarily had the VeriChip tag implanted into their upper right arms, among them patients with chronic or debilitating disease  as well as VIP patrons of a Barcelona nightclub and investigators requiring special access to confidential drug-trafficking case files at the Ministry of Justice in Mexico. Over the next two years, VeriChip and Alzheimer's Community Care plans to inject 110 patients with dementia or Alzheimer's with the chip as well. But VeriChip came under fire in September  shortly after the first 90 or so Alzheimer's patients received its chips in Florida  after an AP report unearthed studies suggesting the chips may cause cancer in laboratory animals. Within two weeks of the AP report, VeriChip's stock plummeted from just under $6 a share to a low of $3.50, a company spokesman says. The AP cited three studies published between 1996 and 2006 that "found that lab mice and rats injected with microchips sometimes developed subcutaneous sarcomas  malignant tumors, most of them encasing the implants." In an exclusive interview with TIME, Silverman provided a list of 34 studies the company included in its FDA application, including one of the three mentioned in the AP article, which showed that less than 1% of 4,279 chipped mice developed tumors "clearly due to the implanted microchips" but were otherwise healthy, and that "no clinical symptoms except the nodule on their backs were shown." The second study, conducted in France in 2006, two years after VeriChip's FDA application was approved, found that while 4% of the 1,260 mice in the study developed tumors, none of them were malignant. As for the third study, Silverman says it was conducted in mice specifically bred to produce tumors, and was therefore omitted from the sheaf of studies included in the FDA application. Other studies that were sent to the regulatory agency also showed tumor growth, but associated only with vaccination sites. Dr. Lawrence D. McGill, a veterinarian and leading expert in animal pathology says the tumor development in rodents is unsurprising. "Even if you put in a bland piece of plastic, it will produce tumors in rats and mice," says McGill, who assessed the studies on behalf of VeriChip. He says it would be a leap to apply the findings of studies in mice to cats or dogs  or to humans, for that matter  which are much more complex animals. Few official scientific studies have been conducted on the effects of microchip implants on house pets, but none have found a link between the chips and cancer, says McGill. If there were a problem, he says, we would have already seen lots of cancer among the approximately 10 million pets that have been chipped over the past 15 years. Says Silverman, "There are no reported incidents to the FDA of any cancer formation around that." In fact, there has been one case of cancer  in a French bulldog named Leon  according to a 2006 study in Veterinary Pathology. But it remains unclear whether the cancer was caused by a microchip or as the result of an injection, or who the maker of the chip was. The dog's tumor was removed in 2004, and a later examination found no recurrence. It seems that no one notified the FDA about Leon, but his case doesn't appear to worry the agency, as evident from a statement it issued when the AP brought Leon's story to light in September. "At this time, we continue to believe that the VeriChip is safe for humans," the FDA said. "In all the safety data the FDA has reviewed for this device, including extensive animal data, we have seen no evidence suggesting toxic or carcinogenic effects." News of the tumor studies haven't yet dissuaded other groups, including Alzheimer's Community Care and the American Veterinary Medical Association (AVMA), from encouraging the use of RFID microchips. Given the large number of Alzheimer's patients in South Florida and the potential for natural disasters such as hurricanes and floods, the VeriChip comes in handy, says Mary Barnes, president and CEO of Alzheimer's Community Care, because, unlike a medical medallion, it cannot be taken off or lost. "In Palm Beach County and South Florida, we have projected over 200,000 Alzheimer's patients," Barnes says. "When you've got that kind of risk out there for our family members ... this type of technology is a godsend." Over the next two years, Barnes will monitor how often medical records change for each of the patients in her agency's RFID program, and will track how the caregivers work with the new technology. "You don't have to be a brain surgeon to figure out this has great possibilities," she says. Meanwhile, a handful of concerned pet owners have expressed interest in removing RFID chips from their furry companions, but VeriChip hasn't heard of anyone doing so yet. The AVMA officially counsels against removing the chip, while assuring pet owners it will continue to monitor the situation. "At this point we do not recommend that people should stop microchipping," says Dr. Rosemary LoGiudice, a veterinarian and assistant director with the AVMA. "We are actively watching. For the number of animals that are said to actually have microchips, when you consider the number of animals that have been microchipped and returned to their owners, the benefits are huge compared to the few and suspect cases that have been reported to have tumor formation." At VeriChip, the outlook remains hopeful. Silverman says his company is bracing for the negative press by gathering up studies that prove the safety of its product. Even though the public hasn't yet warmed to RFID tagging, Silverman says that sales are brisk and expects this year to double the 1.7 million chips sold in 2006.